Chop off the top portion of the garlic head to reveal cloves. Peel any excess paper/skin off from the bulb of garlic. Pour about a teaspoon of olive oil on top the garlic cloves and cover with foil. Roast in a baking dish for 45 minutes, or until golden brown and soft. Allow to cool and then squeeze garlic out of the paper skin into a small bowl and mash well with a fork, set aside. At the same time roast the squash. Slice the squash lengthwise and rub a drizzle of oil all over the cut side of both squash halves and sprinkle with salt and pepper. Place cut side down on a baking sheet and bake about 30 to 45 minutes, or until the squash is just tender enough to scrape into strands. You want it to be barely tender, it will continue cooking later. 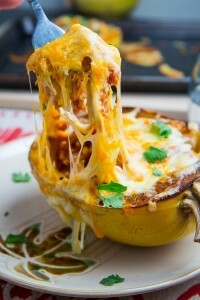 Remove from the oven and scrape the squash into strands. While the squash bakes make the sauce. In a large skillet, cook 1 tablespoon of olive oil and the pancetta over medium heat, stirring, until the pancetta is lightly browned, about 5 minutes. Add the onion, bay leaf, thyme and sage and cook, stirring until the veggies are softened, about 5 minutes. Push to the veggies to the side of the pan. Increase the heat to medium-high. Add 1 tablespoon olive oil to the center of the pan and crumble in the chicken sausage and cook without stirring for 3 minutes. Break up the meat and continue to cook, stirring occasionally until well browned, about 3 minutes. Add the tomatoes, basil and 1 cup water to the skillet. Simmer, stirring occasionally until thickened, about 15-20 minutes. Once the sauce has thicken a bit, discard the bay leaf and season with salt and pepper. Remove from the heat and stir in the mashed garlic. Meanwhile, in a medium saucepan, melt the butter over medium heat. Add the flour and cook, whisking constantly, for 1 minute. Whisk in the milk in a steady stream and simmer for 2 minutes, whisking throughout. Remove from the heat, stir in all of the provolone and season with nutmeg, salt and pepper. Let cool, stirring occasionally to prevent a skin from forming. To assemble the boats, remove a little of the squash strands from each boat. Then place a layer of the meat sauce on top of the remaining strands, then a layer of the cheese sauce, then layer the removed squash strands on top of the cheese and divide the remaining meat sauce among the boats. Lastly, top with the remaining cheese sauce and shredded mozzarella cheese. 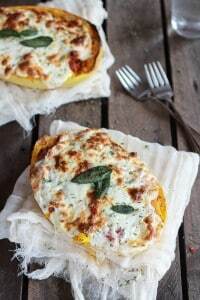 Place the squash on a baking sheet and bake for 20-30 minutes at 350, or until the squash are warm throughout and the cheese is browning. Remove from the oven and let sit 5 minutes. Garnish with fresh sage, fried sage or basil. EAT! 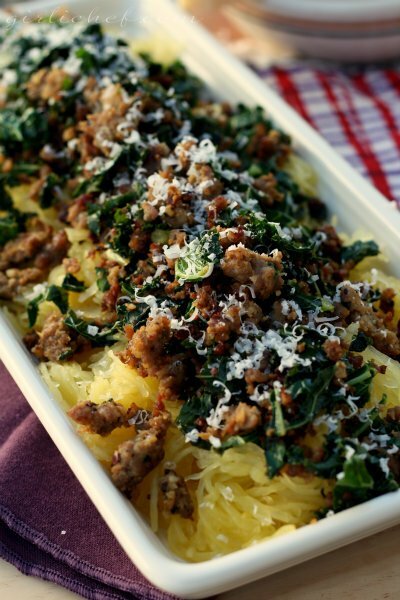 Wash the spaghetti squash and then slice off the stem at the top. Cut each squash in half lengthwise and then use a spoon to scrap out the seeds and the darker yellow strands that the seeds are attached to. Broil in the oven for about 5 minutes so that the cheese is bubbly and golden brown, then serve! 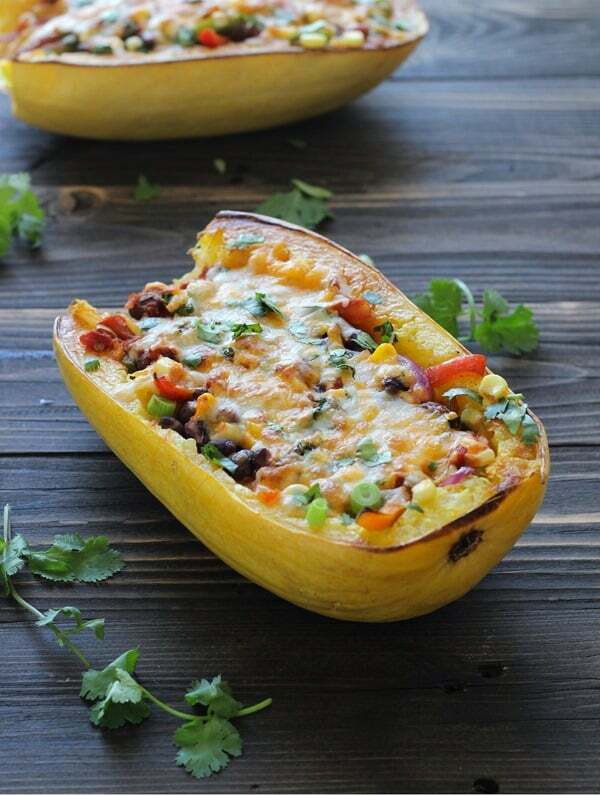 Spaghetti squash boats filled with chicken enchilada inspired filling and topped with plenty of melted cheese! Cut the tip and the tail off of the squash and then cut in half lengthwise. Scoop out the seeds. Set both halves, cut side down, on the prepared baking sheet. Roast for 45 minutes – 1 hour, or until tender (the tip of a small, thin-bladed knife should slide in easily). Set aside for a few minutes, until cool enough to handle.